Burrill Lake SUP Shop is a Hobie Accredited Dealer and we stock a wide range of stand up paddle boards and associated surfing accessories. 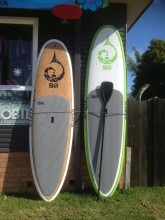 Our Stand Up Paddle Board range covers – Hobie, Honu, Supco, Natural Rhythm, Angulo, and more. Do you have a specific requirement? – Then please call me and we assist with advice & source your product. Burrill Lake SUP has in store starting package specials – commencing from $900.00 including all necessary items to have you enjoying the sport immediately.